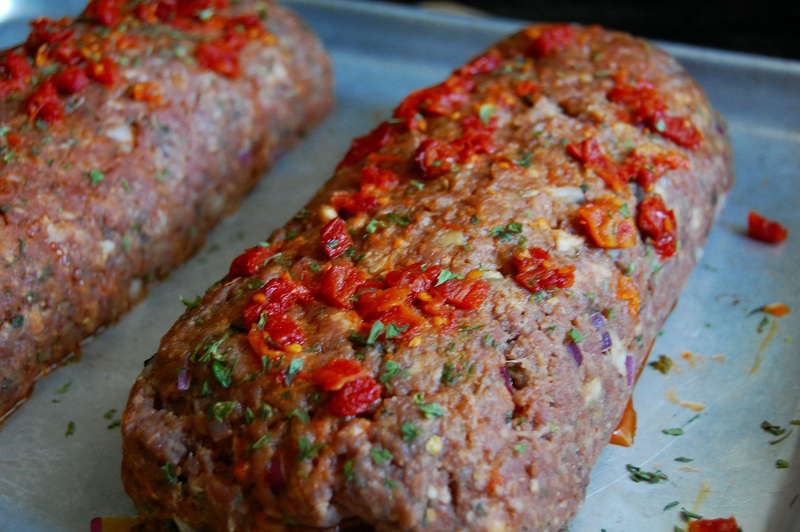 Meat loaf happens when you have a meatloaf addict in the house and as I have mentioned many times, I don’t have a favorite and I didn’t grow up with a “family” meatloaf recipe so I steal recipes from others and adapt them. This time I chose a recipe from a fellow blogger at Bite by Michelle, follow the link and drool over gorgeous photos. Thank you Michelle. 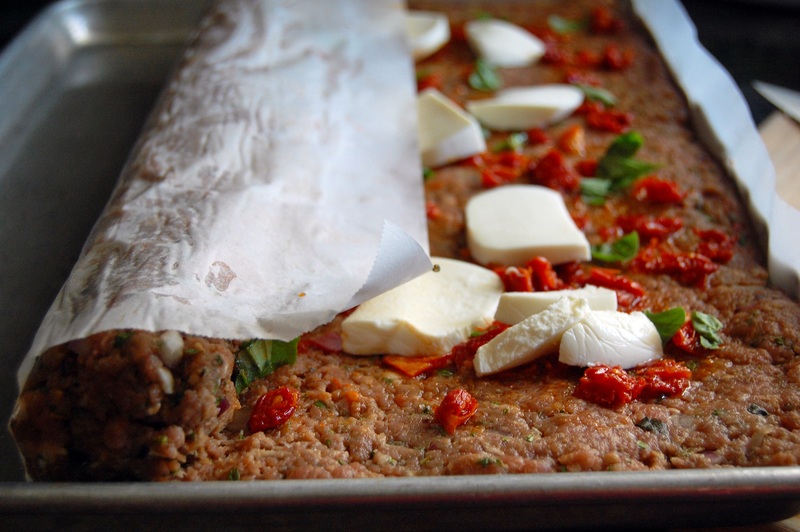 Now this is a big girl meatloaf loaded with lots of goodies that I am instinctively drawn to like mozzarella, sun-dried tomatoes, and basil just to name a few. The meatloaf is huge and I chose to make the entire recipe and freeze half of it for another dinner. Not too many ingredient adaptations with the exception of diced sun-dried tomatoes, and I used a fennel spice concoction that I have on hand. Fennel seed is rather expensive so the seasoning is an excellent way to get the fennel flavor and then toss in some seed if you feel the need to see them in larger pieces than after they have been ground. I think the recipe is from Michael Chiarello, I’ll check on that later. Useful tips for this meatloaf process: lightly oil the pan before covering the pan with the sheet of parchment, use a rolling pin and gentle pressure to shape the meat in the sheet pan, of course use the parchment to roll the meat after topping it, gently tucking the meat as you roll the paper, keep the ends neat by patting the meat into place, and finally gently roll the meat onto the oiled baking sheet. I was successful in cutting the meatloaf in half, tucking and patting the meat to cover the filling that was showing at the end of each loaf. I did a partial freeze with one half then wrapped it in plastic and two sheets of foil, ready for another night. A little more of the diced sun-dried tomatoes and a sprinkle of fennel seasoning adorned the top before placing it into the oven.